I received the mentioned subscription box from Woman Up Box in exchange for an honest review. The thoughts contained within this post are mine and may vary from the thoughts of others. Last month we received our first ever box from Woman Up Box and impressive was definitely an understatement. If you would like to read that review check it out here: Woman Up Box August 2017 and see what we had to say. 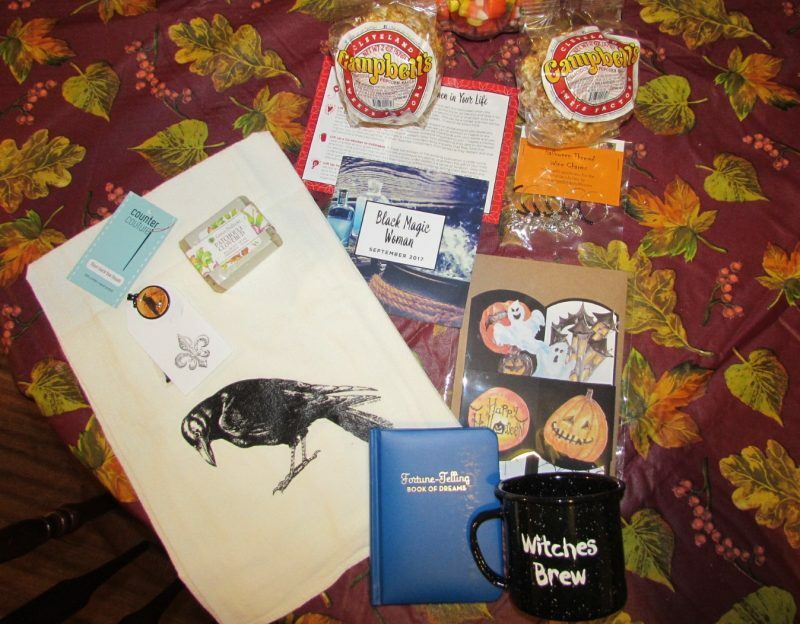 The September box arrived a few weeks ago and Oh.My.Goodness! I do not have the words to describe how each one of these products spoke to me. I was left feeling like this box was created just for me. The box title for the month is Black Magic Woman (how fitting!!) and there was a bunch of amazing stuff pictured above. Let me tell you, those popcorn balls did not last much past this picture. I couldn’t even resist them and we dug in. They were extra fresh and the perfect sweet snack for after dinner. The popcorn balls were just a highlight though, I want to talk about what else this amazing box had to offer and give you guys more information on how to start your own subscription and better yet even win one of your own (see below). One of my favorite parts of this box are the Lift Up Cards that are included with ideas for lifting up other special women in our lives, but also how to do things for ourselves. As a wife and mom I often forget to take time out for ME and I am learning that I need that. I need my own time, space, an energy refill, to center myself… whatever you want to call it, as women we need to be certain to take this time each week. 1-Patchouli & Cloverbud Soap– AMAZING. This smells so good just sitting on my counter that I do not even want to use it. It has made our home smell great and it is such a perfect scent for the cooler days (I wish those would hurry up and get here by the way!!) You can get this soap at greendaffodil.com it retails for $4.00. 2- Caramel Popcorn Balls- We talked about those already. Simply delicious and retailing for $1 each. My Mom tells a story about a lady handing these out in her community for Halloween and how the kids had to have them. I always think about that each time I see a popcorn ball. 3- Fortune Telling Book of Dreams- What a cool guide to tell us what our dreams mean. I have been able to gain some insight into my dreams with this fun guide and I love just looking through it to just read. This book is vintage inspired and super cute! $9.95 by Andrea McCloud. 4- Halloween Pop Up Card- Our 4 1/2 year old son loudly proclaimed he was sending this to my parents for Halloween before I could ever finish my unboxing. He loves it and really can’t wait for Halloween to get a little closer so that he can send this and see what they think. This is handmade and pops out, but folds flat for mailing. Check out QueenBeeInspirations on Etsy! $6.95 for this card. 5-Tin Halloween Mug- ADORABLE little mug that says witches brew and has a witch on the opposite side. This little mug is 12 ounces and was stolen for me by the above mentioned 4 1/2 year old. He drinks his orange juice every morning from this mug and I have never gotten a chance to use it, so word of warning if you have kids, buy 2. $22.00 for this mug and it was a Woman Up Box Exclusive! 6-Raven Pendant- I can’t wait to wear this to add something special to my Halloween outfit when taking the boys trick-or-treating this year. It is sure to be an eye catcher. Made by Georgia Teaberry on Etsy it is on a 26 inch chain and is $14.50. 7-Halloween Wine Charms- I want to invite everyone I know over for a party (okay not everyone, but some fun girlfriends) and have these on the wine glasses. They are so so cute and add just the right flair to any fun Halloween themed drink (side note, check out Pinterest for all kinds of fun Halloween inspired foods and drinks. We have a Halloween album full!) These are $8.00 and made by winewifehappylife on Etsy. 8- Raven Tea Towel– Last but certainly not least, this flour sack towel looks perfect in my kitchen this season and I love that it soaks up water so well but does not leave a bunch of mess behind like other fabrics. I am no stranger to flour sack towels but this one is amazing. $13.00 from CounterCoutureDesign on Etsy.com. Subscriptions start at $49.95 and as you can see you are getting more than your money’s worth from this. I am always anxious to review subscription boxes because often I feel that some do not give you the bang for your buck or you are left feeling like “where is the rest” but with Woman Up Box this is simply not true. Want to win one? Check out our giveaway!! the caramel popcorn balls are my favorite. The halloween wine charms are my favorite. Fortune Telling Book of Dreams is my favorite. I would love to know what some of my dreams mean!